I just disabled all alarms and the SmartGuard feature of the pump. I have great trouble getting the Enlite sensor to be accurate. Maybe it's just me, maybe the sensor finds my tissue hard to read, maybe I'm not calibrating it right, maybe there was something off in the manufacturing or transportation of the particular batch of sensors. The sensors just keep giving me numbers that are way off from what my glucose meter says. 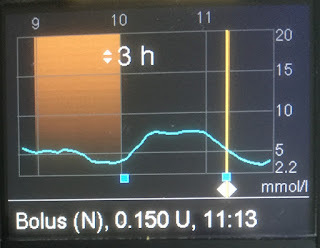 At 10 am, when I woke up, the pump told me the sensor reads my glucoses at stable 3.8 mmol/l and the SmartGuard feature has been activated to save me from going too low. I did not feel low at all, so checked with the meter. It said 9.9 mmol/l. And 10.4 mmol/l when I measured again. And after washing my hands carefully, still 10.2 mmol/l. The real glucose level was clearly around 10 mmol/l. I dismissed the SmartGuard to resume the insulin flow, and injected some insulin to bring my glucoses down. I did not calibrate at this point, as I was sure the calibration that far from the sensor reading would be rejected by the transmitter. I felt a bit frustrated, as I thought the SmartGuard action of the night was likely the reason for the high level. It may also be that my glucose levels had really been low and then bounced back up due to my liver releasing some glucose into my bloodstream just before I woke up, so the sensor just did not have time to catch the change. An hour later (at 11:12), just before breakfast, my meter told me I was at 6.9 mmol/l, so I bolused accordingly. Again I did not calibrate, as although the meter reading was now much closer to that of the sensor's (5.2 mmol/l), there was an downward arrow in display, so I knew my glucoses were still dropping, a bad time to calibrate. Shortly after, the pump buzzed and told me that insulin delivery had been stopped again, to save me from going too low. I needed to dismiss the SmartGuard again, as I knew I wasn't that low, and was currently eating, which would rather bring my glucoses up soon. In addition to that, it took me a while to find the amount of bolus insulin that had been injected (only 0.15 units -- the bolus delivery rate of the 640G is really, really slow! ), and even longer to find the real amount that should have been injected. While I can understand the logic the sensor and the pump used, and acknowledge I'm not yet familiar with the menu system and that's why it takes me time to get around and perform some actions, I became frustrated. It felt I was just fighting an enemy, rather than working together to treat me in the best possible way. I have used the Dexcom G4 CGM for more than a year, on and off. Before that I occasionally got a CGM (either Dexcom or Medtronic one) from my clinic for a week. Throughout this time, I've gotten better results from the Dexcom. 90% of the time, it shows what I expect when calibrating it (that is, within 15% of the reading of my glucose meter). And 90% of the time it's off, it's easy for me to see, in retrospect, the point when it got off the track and also back on track. Either I calibrated when my glucose levels were changing rapidly, or I probably slept on it, causing the so called 'pressure low'. With the Enlite, I have never gotten the same feeling. I have no idea why it behaves the way it does. When searching the internet, I find I'm not the only one with these issues. See for instance the end part of this review: http://www.healthline.com/diabetesmine/medtronic-minimed-connect-review. I also had a short discussion about the issues in Twitter. Calibrate at least 3 times within first 5 hours after inserting the sensor. Only calibrate, if bg/ISIG is above 0.14 and below 0.44, applies when bg is in mmol/l). Pay attention to the insertion site. Try inserting the sensor first, connecting the transmitter hours later. I really want to learn to trust the sensor and the system. For me, the SmartGuard feature of the Medtronic Minimed 640G is a really promising step towards an artificial pancreas. A system that would eventually do all the micro management required to control my glucose levels for me. But there's no way I'm giving that responsibility to a system I don't fully trust and understand. Finally, I ask you to remember that in this blog I share my experiences when and as I face them. I may be totally in love with the system next week.